The Honeyman Group is reaping the rewards of its award-winning HydroGienic® water supply system. HydroGienic® received the Cleanroom Technology 2018 Award for the Best Innovation, as well as the Queen's Award for Innovation. Manufacturing facilities that require a pure water supply for production need chemical and microbiological qualities to be carefully controlled for both product manufacture and processing. Water is often part of a product and pure water can also be a process intermediate used for equipment washing or cleaning vessels and facilities. Despite having such an important role in manufacturing processes in a range of sectors, including pharma and food industries, the last quarter-century has seen little technical advancement in bulk, high purity water systems. Exceptions are new water purification technologies such as electro-deionisation and the increasing use of ozone as a water-borne, residual sanitant in storage/distribution systems. For those who are not familiar with pure water systems, these are made of two distinct parts: purification and storage/distribution. It is relatively easy to purify water to a pharmaceutical grade by a variety of reliable and established techniques such as ultra-filtration, reverse osmosis, electro deionisation, distillation, etc., and many combinations of these with other pretreatment processes. However, the challenge for many systems currently available is to maintain the quality of the purified water within the storage tank and piping delivery system all the way to the user points. This challenging task is at the heart of HydroGienic, Honeyman’s patented, proven, and award-winning water supply system. The maintenance of microbiological water quality within an ambient purified water system relies on the design, engineering, and operation of the storage and distribution stage. Despite this critical function, there has been no fundamental development in the storage/distribution stage of pure water systems. Conventional hygienic piping configurations employ stainless steel ring mains, which are constantly recirculating throughout facilities. User off-takes – where user points connect – branch from these loops as they pass by the relevant user points one-by-one in a series. The fundamental purpose of the storage/distribution system is to store pure water in a suitable tank or vessel and to distribute it via hygienic plumbing to all user points in the facility while maintaining consistent water quality. This simple objective is not easy to achieve, particularly in large buildings with a high number of user off-takes and long lengths of pipework. One of the main constraints of conventional systems is the hydraulic limitation of the piping system: its ability – or lack thereof – to satisfy all user demands. A good design is able to maintain adequate flows and pressures under all user conditions, and maintain consistent water quality at the user point at the same time. In maintaining acceptable flows and pressures, many conventional system designs allow only a few off-takes to be used together, giving rise to very low diversities. Diversity is the percentage of user off-takes that can be opened at any one time. Lack of diversity is a serious constraint for production users and manufacturing efficiency. Standard systems can provide a higher numbers of off-takes to be used at the same time, but to do this they become inefficiently ‘over-designed’. A major limitation of the stainless steel recirculating ring main is inflexibility. From day one, all user points and demands must be catered for and translated into pipe sizes during design. Should there be future changes in requirements – for example, a need for more off-takes, user points to be removed, or positions changed – it is likely the original system may not be adaptable in meeting these new demands. Even if it is hydraulically possible to meet a new demand, production normally has to stop while the ring main is being modified with welding. With revalidation, it can take a week or longer to resume production. This approach is not only disruptive and expensive, but also, the inflexibility of water system design can have a detrimental impact upon the expansion, growth and development of a facility. The installation of hygienic stainless steel ring mains is a rigorous process, which is costly, time consuming and disruptive to operational facilities. Polished stainless steel tube and fittings are welded together in-situ by ‘orbital welding’; the installation of welded, stainless steel ring mains often takes several months and the facility may need to be closed, or severely curtailed during installation. In addition, there is an onerous and extensive requirement to qualify and certify the welding of stainless steel loops. Generally speaking, this operation requires a material certificate for each length of tube, fitting, tee, elbow, etc., with full traceability, quarantined storage and handling of all materials. Inspection criteria leads to an extensive and expensive qualification/validation process for the installation of stainless steel welded ring mains. Rouge – rusting of stainless steel – is increasingly observed and reported in conventional systems; it produces red/brown deposits and stains on many internal parts of pure water piping systems, including exits points into processing vessels and production equipment. A major contamination risk, rouge is indeed a concern for manufacturers and regulatory bodies alike. Most instances of ‘rouging’ relate to hot WFI (water for injection) systems operating at elevated temperatures around 80oC, but it is a significant and increasing problem for pure water systems that are heat sanitised. HydroGienic® delivers a solution for this. Featuring a parallel system, each user point is supplied from the tank with its own, individual recirculating loop from a central distribution skid in the plantroom. This system maintains hygienic flow and pressure conditions to each user off-take independently, whether the tap is open or closed. Energy efficient: the low amount of water recirculating when user taps are closed leads to a more energy efficient system. There are more benefits. The pipework for a parallel system like this needs only to be sized according to the single off-take served. This reduces the diameter from conventional 1-inch to 3-inch to a much smaller 1⁄4 inch to 3⁄4 inch for the parallel HydroGienic arrangement, as summation of flows from off-takes no longer needs to be calculated within pipe diameters. These small pipe diameters may be effectively and easily served by alternative materials to welded stainless steel, i.e. the use of a PTFE hose. The PTFE hose is widely accepted and used within the pharmaceutical, food and dairy industries, and complies with all of the standards and requirements for such applications. The PTFE (Polytetrafluoroethylene) hose provides significant advantages for pure water distribution applications at all operational temperatures and pressures, and under all typical sanitising conditions both thermal and chemical. The combination of parallel user off-take configuration and small bore PTFE hoses forms the heart and essence of the HydroGienic system. Recirculating ring mains used for the distribution of pure water have been installed as convention because of the lack of a better alternative, until now. With Honeyman’s HydroGienic®, winner of this year’s Queen’s Award for Innovation and the Cleanroom Technology Innovation Award, the marketplace has a powerful tool to move forward. 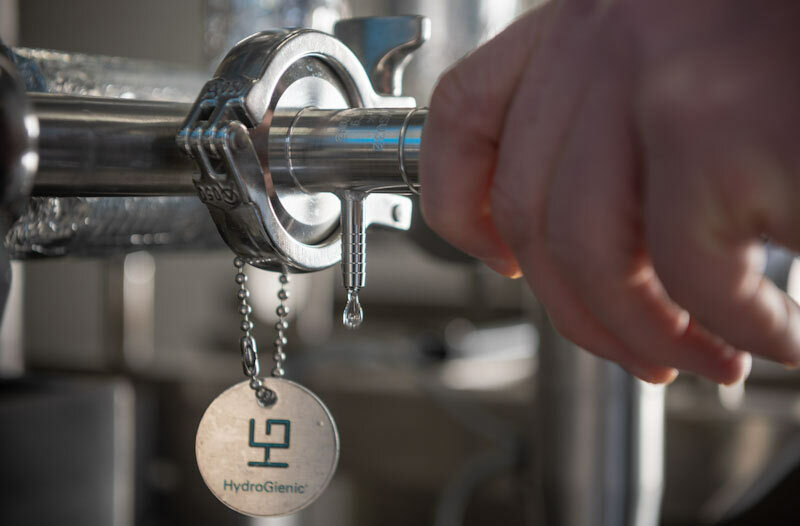 With increasing pressure on business performance it is imperative to improve both the delivery implementation and quality of pure water systems for manufacturing efficiency.